In Haida Gwaii, we are lucky to have a rich variety of local bird life. Mary Morris compiled an incredible checklist documenting species records from notes at the Royal BC Museum in Victoria. Reviewed by Wayne Campbell, John Cooper, Mike Bentley, Peter Hamel and others, this list was printed with the support of the Public Conservation Assistance Fund. This most recent digital edition was published in 2010, and is transcribed off the 2001 print edition. The Ancient Murrelet (ANMU) is a pigeon-sized, black and white seabird named for the tuft of white feathers on the top of its head that make it look like an old man. Ancient Murrelets nest on islands in Alaska, Russia and Japan. Around 50% of the world’s population of Ancient Murrelets nest in Haida Gwaii – about 260,000 pairs – in about 30 colonies. East Limestone Island is one of the smallest colonies. They use their wings to swim underwater to feed on plankton and small fishes. 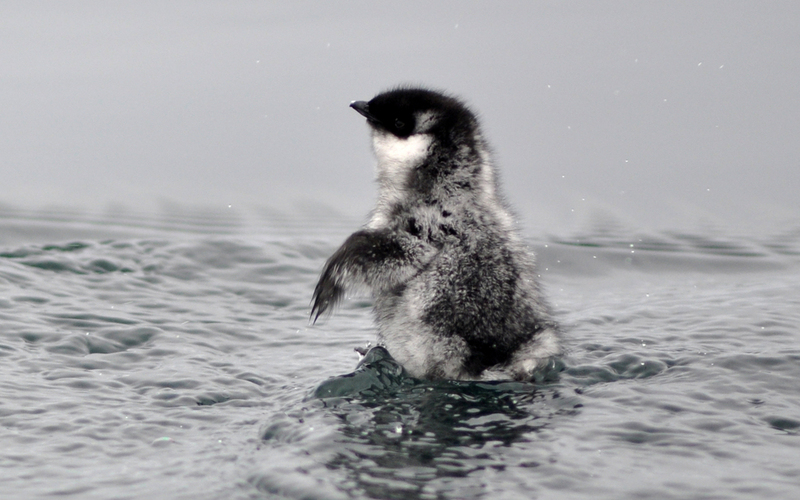 Unlike most seabirds that bring food to their young in their nests on shore, murrelets have the unusual habit of taking their two day old young to feed in the ocean. To give the young stamina for the difficult trip from the burrow to the sea, the Ancient Murrelet lays very large eggs. Murrelets, along with other auks, are the ecological counterparts of penguins in the northern hemisphere. Murrelets seem to be faithful to their colonies and raise only two young per year. Thus, they are very vulnerable to the effects of oil spills, and predation from introduced predators like rats, foxes, cats and raccoons. Local populations, if reduced by predators or oil spills, take a long time to recover. The Black Oystercatcher (BLOY) is a large black shorebird recognized by its large red bill, pink feet and persistent call. The picture shows an adult with a partially-grown chick. Black Oystercatchers are found on islands and rocky shorelines all along the Pacific Coast of North America from Baja Mexico to the Aleutians in Alaska. Oystercatchers feed on shellfish, limpets, mussels, and small abalone and may live up to 25 years. Thus, Black Oystercatcher abundance is an indicator of a healthy ocean and intertidal environment. Black Oystercatcher nest in small depressions in the rocks and lay up to three eggs. Usually there are only a few pebbles and white shell fragments in the nest and both the nests and eggs are well camouflaged. Although the adult birds defend the nests very vigorously, there is still frequent predation from eagles, ravens and crows. Both adults feed the young birds. Each bird seems to be a specialist in a particular kind of shellfish and some of the nests are ringed with limpet shells, others by small mussel shells. Adults continue to feed their young after they leave the nest and the well-camouflaged young birds stay close to the nest scrape even when the chicks are quite large. There are about 20-25 pairs of nesting Black Oystercatchers on the islands in Laskeek Bay, and usually three pairs nest on East Limestone Island. Almost all of these nest sites are long established and used every year. Over the years, LBCS has banded a number of young chicks. Some of these banded chicks have begun to nest in the area at the age of five years. The Marbled Murrelet (MAMU), in its summer plumage, is a little brown seabird that is typically seen on the water in pairs, which dive suddenly when approached. They have narrow pointed wings and are very fast flyers. The Marbled Murrelet is found all along the coast of BC and from California up to Alaska. It is estimated that up to one third of the world’s population nest in BC, and a significant proportion of that population nests on Haida Gwaii. Like other auks, Marbled Murrelets feed by underwater pursuit, using their wings as paddles. Not much is known of their diet. The nestlings are fed wholly on fish, especially sandlance, and fish probably predominate in the adult diet as well. The Marbled Murrelet nests high in the branches of coniferous trees, lays a single egg, and feeds their single chick with fish until it is old enough to fly to the ocean to feed itself. Although many birds were seen on the ocean, for a long time no one knew where the Marbled Murrelet nested, how many eggs it laid or how young birds made their way to the ocean. Some thought the Marbled Murrelet nested in colonies or in burrows and led their young to lakes and streams that carried the young birds to the ocean. The first strong evidence that the Marbled Murrelet nested in trees came when a young bird and egg shell fragments were found accidentally by a logger who had felled a tree near Juskatla on Haida Gwaii in the 1950s. It is only in the last few decades that substantial numbers of nests have been found by radio-tracking breeders and by tree-climbing biologists. The Marbled Murrelet is a “red listed species” - meaning that its population is declining as a result of habitat loss though logging of its nest sites and mortality with gill nets on the ocean. It is an important concern for biologists and environmentalists and much research is underway to determine what is needed to protect sufficient nesting habitat for this endangered species. Marbled Murrelet are found on the water around East Limestone Island and in inshore waters throughout Laskeek Bay during the daytime throughout the field season. They are usually in pairs or in small groups of three to eight riding the waves within one kilometer of shore, and occasionally diving for up to a minute, then emerging with a fish. The Marbled Murrelet does not nest on East Limestone Island or Reef Island, but almost certainly nests in valleys on Louise Island and the inlets of Moresby Island. Pelagic Cormorants (PECO) are shiny black birds of the ocean with long slender necks and thin dark bills. In nesting season, breeding adult birds are recognizable by their prominent white patches on their flanks. The Pelagic Cormorant flies with neck extended, not crooked. The Pelagic Cormorant’s range is from northern Alaska to Baja California. On Haida Gwaii, it nests in a number of locations – in small colonies from a few nests up to 100 - around Moresby Island and the west coast of Graham Island. Cormorants feed primarily on small fish. They dive deep, sometimes all the way to the sea bottom, and swim with their feet to chase their prey. Pelagic Cormorant nests are untidy saucers of kelp and other marine debris, and may include bits of fishing net and rope. They are normally situated on a small ledge on a vertical, or near vertical cliff, frequently on sites protected by overhanging rocks. 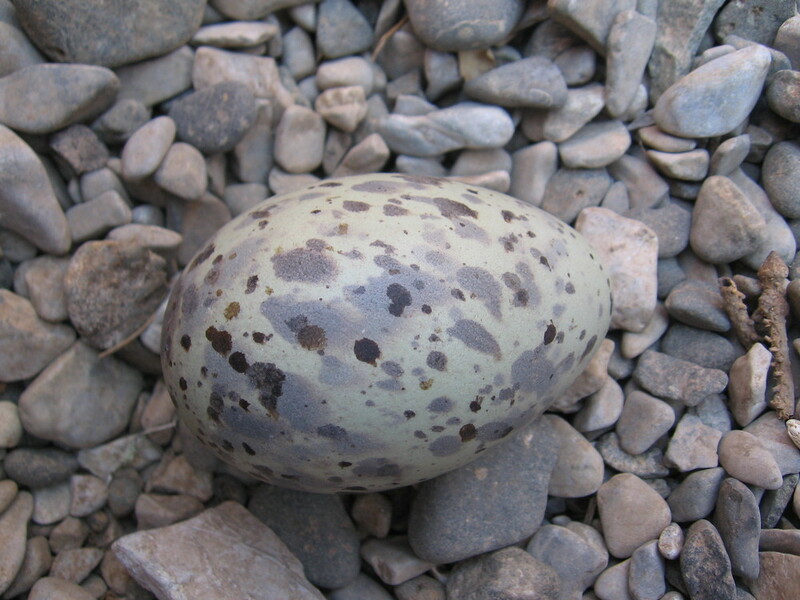 Clutches consist of 2-6 eggs, and are laid from May to July in BC. Although ubiquitous, Pelagic Cormorants are not often found nesting. This is partly because there appear to be many non-breeding birds present in South Moresby in summer and partly because they use rather cryptic nest sites, frequently in caves, rock clefts, or other very sheltered places. 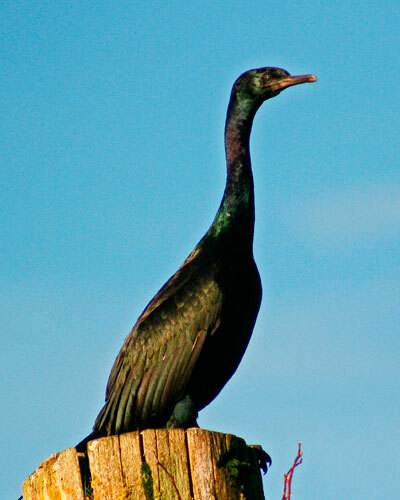 The Pelagic Cormorant is the most common of the three species of cormorants found in Laskeek Bay. The other two species – Brandt’s Cormorant and Double-crested Cormorant - do not nest on the islands and are only seen occasionally in Laskeek Bay during the field season. They are more common in fall, winter and early spring. The Pigeon Guillemot (PIGU) can be recognized by its white wing bars and bright red feet as well as its whistling call and the bright red linings on the inside of its beak. The Pigeon Guillemot is widely distributed along the Pacific Coast from California to the Aleutians and northern Russia. It breeds all along the coast of BC and is common on the rocky and protected shorelines of Laskeek Bay. Although common in spring and summer, the Pigeon Guillemot seems to leave the island and is rarely seen during the fall and winter months. Their main diet is small fish, and like the other auks, PIGU swim underwater using their wings to chase their prey. The Pigeon Guillemot nests in crevices in rocks or under the roots of trees right at the high water mark. It lays two eggs in its rocky burrow and feeds both young with fish until they are fully-grown. The task of feeding the two young requires the adult birds to make many trips throughout the day and they are often seen returning to shore with a single fish in their bills. With its bright red feet, very active behavior, slightly comical flight and ungainly landings on land and water, the Pigeon Guillemot is a favorite with many of the visitors to Haida Gwaii. Reef Island, a large island without raccoons, supports several hundred pairs. There are ten wooden Pigeon Guillemot nest boxes on East Limestone Island, many of which are active each year. The Red-breasted Sapsucker (RBSA) is identified by its bright orange/red breast and head and white wing patch. The Red-breasted Sapsucker is distributed along coastal BC but does not winter in Haida Gwaii. It returns here in the spring from southern Vancouver Island and the mainland to nest. Sapsuckers do not actually eat sap but drill holes to initiate a flow of sap, which then traps various insects, on which the birds feed. These drill holes are small rectangles drilled in long straight lines up and down the trunk of hemlock trees and are quite noticeable as fresh scars on the trees in spring. Each Red-breasted sapsucker nest tree has hemlock feeding trees with lines of drilled holes nearby. Nests are excavated in the spring. Red-breasted Sapsuckers excavate a new nest cavity every year but often use the same tree (with a different hole) for several years in a row. The Red-breasted Sapsucker is the most common of the three woodpecker species found on Haida Gwaii. On East Limestone Island, over 10-20 Red-breasted Sapsucker nest sites are found each year, a very high density of woodpeckers on a 48 hector island. This is probably due to the large numbers of snags, and the relatively dry environment created by the constant winds. The Varied Thrush (VATH) is a forest bird similar in size and appearance to a Robin. It has an orange eyebrow and orange wing bars. The male has a black band across his chest. The Varied Thrush is widely distributed in the forests west of the Rockies. The Varied Thrush feeds mainly on berries and insects, and can often be seen low in tree branches or foraging in shrubbery close to the ground. The female builds the nest in a conifer at the base of a branch, against the trunk. The female lays and incubates 3-4 eggs, and both parents feed the young. The Varied Thrush is one of the most common forest birds on Haida Gwaii and is a prominent part of the dawn and dusk choruses of bird songs. It has several songs, but the eerie, long mechanical sounding whistle is the most noticeable. The Varied Thrush is a year round resident and nests on East Limestone Island. Two other species of thrush – the Hermit Thrush and Swainson’s Thrush - are migrants that arrive on the island in spring to nest. The Bald Eagle (BAEA) is a large bird of prey with a distinctive white head and tail and a large hooked bill. Juveniles are dark with white streaking, and acquire full adult plumage after four to five years. Throughout North America, usually near lakes, rivers and coasts. A skilled hunter, the Bald Eagle swoops from a perch or the air to capture prey in its talons. It feeds mainly on fish, other birds and mammals that it captures or scavenges. Eagles nest near water, and may use the same nest many years in a row. Bald Eagle lay 1-3 eggs and the eggs are incubated by both parents. Bald Eagles sometimes hunt cooperatively, with one bird chasing prey toward another. The Bald Eagle is a year-round resident of East Limestone Island. Several nests have been located and are monitored during the breeding season, and usually one or two of these nests are active each year.